TL:DR: Football is not the only sport that taps data, research and innovation to improve athlete performance. Coaches and athletes in other sports are also turning to technology to get a leg up in international competitions. 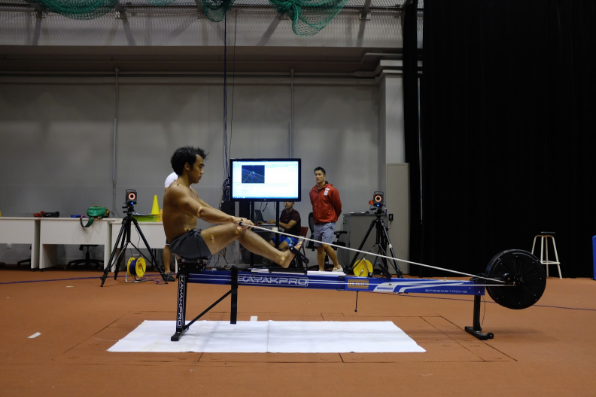 We look at how video-based analytics and a 3D motion capture system are helping Singapore’s athletes train better and smarter. Ultimately, a multidisciplinary approach is needed to support our athletes in their quest for sporting excellence. Perhaps the World Cup is not your cup of tea. Or maybe you just don’t get a kick out of team sports and the technologies that support them. The good news is, football is not the only sport that taps data, research and innovation to improve athlete performance. TechNews spoke to Mr Luqman Aziz, a biomechanist at Sport Singapore, on how technology can be used to support our sporting talents in their training and at international competitions. Motion is the defining trait of virtually any sport. Being able to capture, measure and analyse the movement of the human body is the first step towards refining it. Portable and high-resolution video cameras are thus becoming critical assets at sports competitions. Using Dartfish, every action—a punch, a kick, a counterattack—that takes place during a silat match is tagged. When reviewing all the tags, patterns emerge, revealing the behaviours and strategies of competitors. “At the end of the day, we want to gather descriptive statistics of what transpired during a competition. We are then able to provide feedback to the coaches or athletes to help them modify their competition tactics,” Mr Aziz explained. But video-based performance analysis can also be used to directly measure athletes’ proficiencies. For example, Mr Aziz highlighted how he leverages video recordings to track sprinters’ running speeds at 20-metre intervals, building their velocity profiles during 100-metre races. This data helps coaches and athletes identify weaknesses, as well as gauge how effective training programmes are. While video recordings in two dimensions are useful, three-dimensional (3D) motion capture technology can yield even more accurate information about an athlete’s movements. Such fine-grained insights are especially important in sports like kayaking, where the technical precision of each repetitive motion matters. Here’s how it’s done: the athlete is first made to wear reflective markers on the shoulder, elbow and wrist. These markers are tracked in real time by the 3D motion capture system. Any changes in the positions of these three markers will result in changes in the angle of the elbow joint. Mr Aziz noted that Hollywood moviemakers use the same technology to create animated characters—think Gollum from The Lord of the Rings and Caesar from Planet of the Apes. Sports science has simply adapted it for athletes, not actors. “Furthermore, a good stroke could be programmed to trigger a beeping sound, so not only do the athletes receive visual feedback by looking at the graphs, but they also can rely on auditory cues to improve their performance. Some athletes are visual learners, while others are kinaesthetic or auditory learners, so we customise the system to suit their preferences,” said Mr Aziz. For the most part, the response from coaches and athletes to these new technologies has been positive, said Mr Aziz. Importantly, coaches are convinced that the evidence gathered through video-based analytics and 3D motion capture are complementing conventional training regimes. “The crucial thing is to explain to the coaches that what we are recommending is based on past research—we’re not doing things just for the sake of doing them,” said Mr Aziz, adding that Sport Singapore works closely with the National University of Singapore and Nanyang Technological University, Singapore on research projects relating to biomechanics and sports science. He emphasised that a multidisciplinary approach is critical when it comes to creating solutions to help our athletes train better and smarter. “We engage with experts in mechanical, aerospace and computer engineering to help us develop the hardware and software we need. So we craft the questions, and then ask the scientists and engineers to put together the technology and give us feedback on whether they think our ideas are feasible,” he said. With so many parties working behind the scenes to support athletes in their quest for sporting excellence, the definition of a team sport may need an update. But one thing is certain—technology is changing the sporting landscape, and to stay in the race, one must be willing to embrace it.